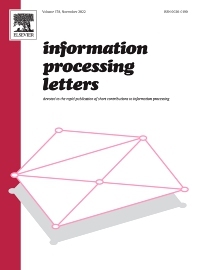 Information Processing Letters invites submission of original research articles that focus on fundamental aspects of information processing and computing. This naturally includes work in the broadly understood field of theoretical computer science; although papers in all areas of scientific inquiry will be given consideration, provided that they describe research contributions credibly motivated by applications to computing and involve rigorous methodology. High quality experimental papers that address topics of sufficiently broad interest may also be considered. Since its inception in 1971, Information Processing Letters has served as a forum for timely dissemination of short, concise and focused research contributions. Continuing with this tradition, and to expedite the reviewing process, manuscripts are generally limited in length to nine pages when they appear in print. More detailed information about the topics of interest and submission format can be found in the Guide for Authors.